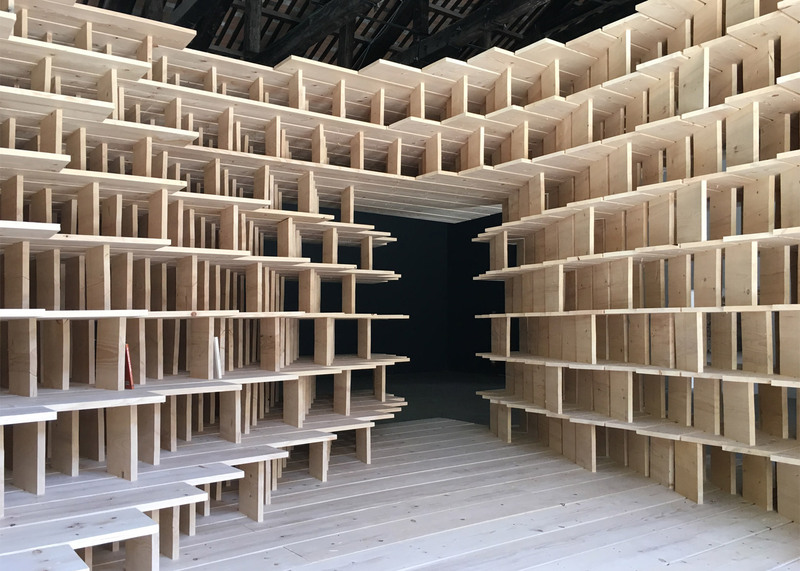 Venice Architecture Biennale 2016: Slovenian architects Aljoša Dekleva and Tina Gregorič have built a wooden library inside their national Biennale pavilion, and invited industry figures including Tatiana Bilbao, Konstantin Grcic and Alice Rawsthorn to fill it with books (+ slideshow). The Dekleva Gregorič Architects founders sought to create a hub of knowledge on home design. To achieve this, they developed a bespoke wooden library that not only accommodates books, but also creates a welcoming cocoon for occupants. Entitled Home at Arsenale, the structure wraps around its space, integrating display areas, shelves and seating. 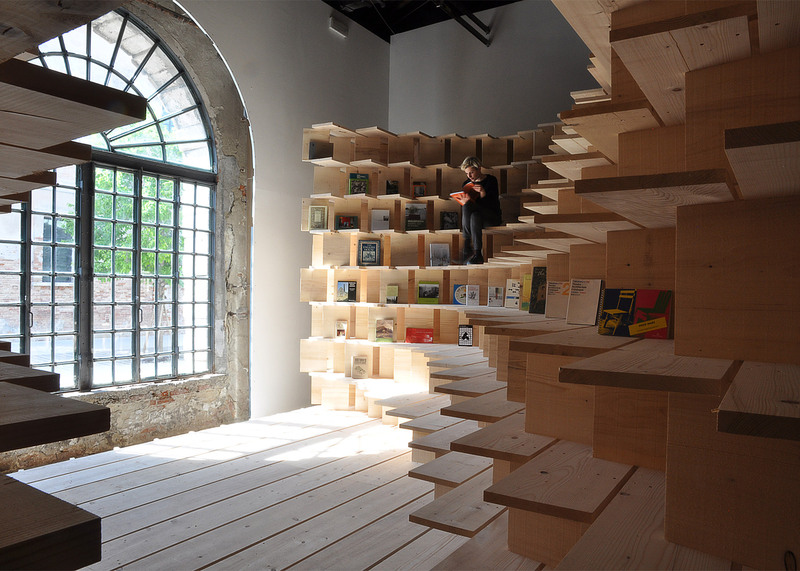 Visitors are invited to clamber up onto its surfaces and leaf through a selection of titles. The collection on show includes approximately 300 books, selected by a range of architects, designers, critics and artists from around the world, but all focussed on ideas about the home. Contributors include Mexican architect Tatiana Bilbao, Sergison Bates co-founder Stephen Bates, Chilean studio Pezo von Ellrichshausen, industrial designer Konstantin Grcic, New York Times critic Alice Rawsthorn, Spanish architect Juan Herreros and Norwegian office TYIN Tegnestue. "The notion of home requires readdressing," explained Dekleva and Gregorič, whose Ljubljana-based studio has completed projects including a stone and concrete cottage and a metal-recycling plant. "Since the dawn of civilisation, structures for dwelling have constructed the predominant part of our built environment, and have served to fulfil our most basic needs. Yet, they should aim beyond securing mere survival to provide the conditions necessary for a meaningful life." "The project Home at Arsenale proposes the concept of home as a public curated library that operates as a platform for exploring the notions of home and dwelling, within the current critical social and environmental conditions," they added. 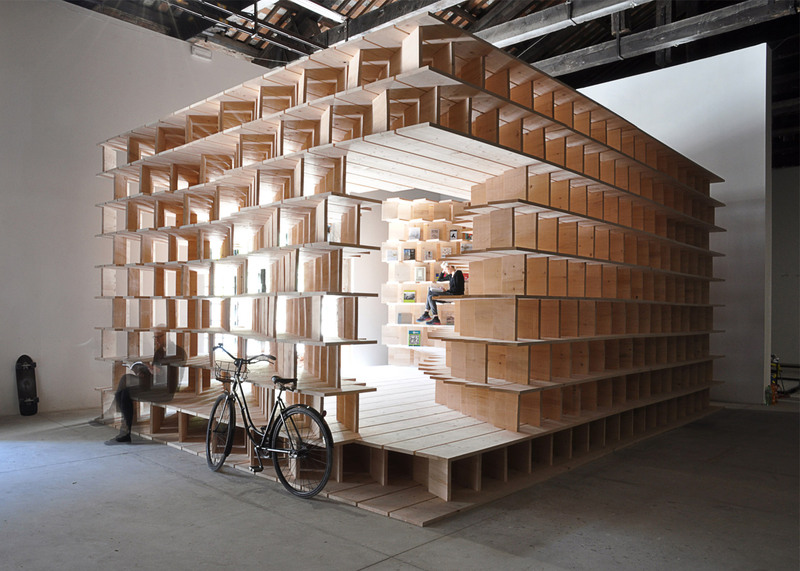 Rather then building a straightforward bookshelf, the installation is designed to perfectly suit the conditions of the pavilion, which is located at the far end of the Arsenale. Each of the shelves is positioned to optimise natural light, which can only enter through one window and a door. Because of this, the structure integrates a wide spectrum of different angles. There are also several curved cavities in the structure, aimed at making the seating areas more comfortable, and a few domestic elements including a pot plant, a coffee table and a bicycle. "The installation inhabits and reacts to the given space in the Arsenale, with a spatial structure containing a curated collection of books and objects of domesticity suggestive of the domestic realm," said the curators. "A 1:1 spatial structure, generated by a site-specific system of wooden bookshelves, performs simultaneously as a curated library and as abstract compact home encouraging visitors to inhabit and experience it." 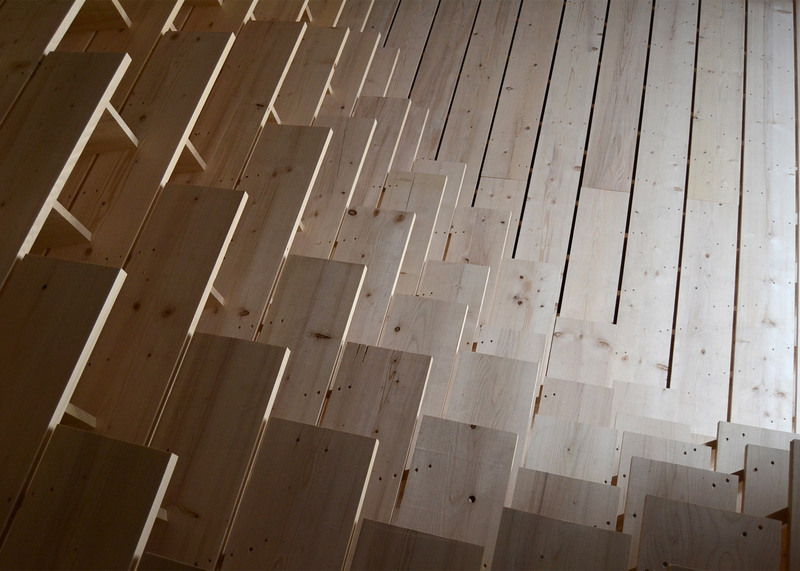 The choice of wooden planks for the installation pays tribute to the importance of the material in the Slovenian construction industry, but also references the timber foundations of Venice, a lot of which was sourced from Slovenia's Karst region. Home at Arsenale is on show as part of the Venice Architecture Biennale 2016, which officially opens to the public this weekend and runs until 27 November 2016. 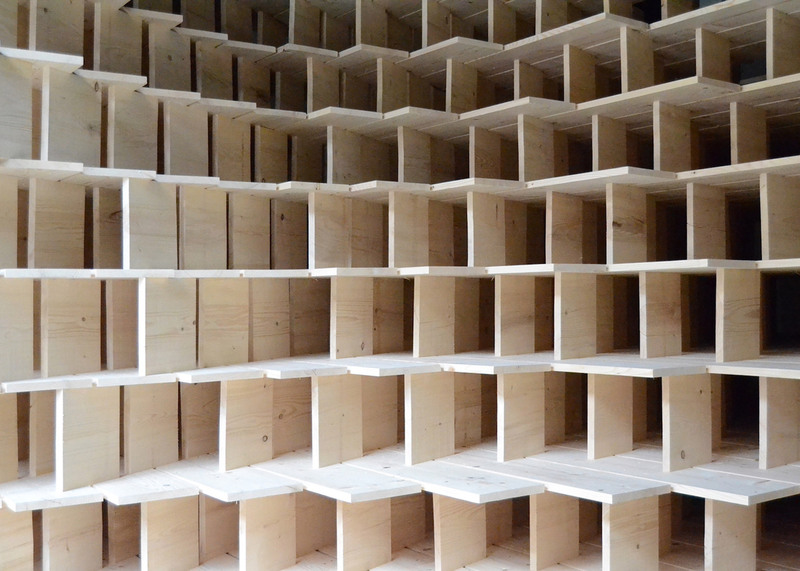 Once the exhibition is over, the library will relocate to the Museum of Architecture and Design in Ljubljana. It is one of several pavilions dedicated to changing role of the home – one of seven key themes set to become big talking points at the Biennale, along with robotic construction and the refugee crisis.